(b. 1910 d. 1974) A graduate of Davidson College, class of 1932, Dr. Grier Martin, LL.D. served as Davidson College treasurer under President Cunningham. He was forty-eight years old when he accepted the presidency of Davidson College and already had demonstrated service, loyalty, and superb administrative ability during his seven years as college treasurer under President John R. Cunningham. A native of Covington, Georgia, Martin attended Emory University and Harvard Business School for his graduate studies. He was awarded honorary degrees from King College, Wake Forest University, Duke University, Erskine College, Davidson College, and the University of North Carolina. During Martin’s administration, the permanent endowment greatly increased and several construction projects were completed or near completion including the E.H. Little Dormitory, Patterson Fraternity Court, Dana Science Building, and Richardson Dormitory. 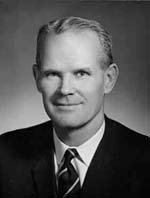 Martin, also, witnessed growth in student enrollment and faculty size; a new curriculum including a foreign study program and humanities courses, the Reynolds Lectures and Richardson Scholars, racial integration, the beginning of data processing, successful financial campaigns, and solid advances in faculty salaries, housing, and fringe benefits.